As of 11:04pm Eastern the rocket had passed Japan with a payload that is unclear but according to Yonhap South Korea news agency it was likely a satellite. Immediate condemnation from all regional countries: Japan government says launch is "regrettable" while S. Korea said launch is a "grave threat" to world peace. The State Dept of the U.S. says the "rocket launch is a serious threat to the northeast Asian region and to the International community." 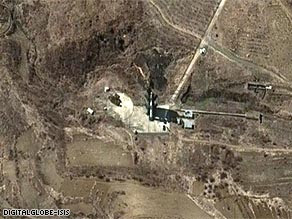 Update 1: Japan has requested an emergency U.N. Security Council session on the rocket launch. Update 2: Russian military confirms launch; US State Department to hold emergency press conference at 11:40pm Eastern. "North Korea's development and proliferation of ballistic missile technology pose a threat to the northeast Asian region and to international peace and security. The launch today of a Taepo-dong 2 missile was a clear violation of United Nations Security Council Resolution 1718, which expressly prohibits North Korea from conducting ballistic missile-related activities of any kind. With this provocative act, North Korea has ignored its international obligations, rejected unequivocal calls for restraint, and further isolated itself from the community of nations. Preventing the proliferation of weapons of mass destruction and their means of delivery is a high priority for my administration. The United States is fully committed to maintaining security and stability in northeast Asia and we will continue working for the verifiable denuclearization of the Korean Peninsula through the Six-Party Talks. The Six-Party Talks provide the forum for achieving denuclearization, reducing tensions, and for resolving other issues of concern between North Korea, its four neighbors, and the United States. North Korea has a pathway to acceptance in the international community, but it will not find that acceptance unless it abandons its pursuit of weapons of mass destruction and abides by its international obligations and commitments." A little noticed document Moody's released on March 24 entitled "Moody's Approach to Evaluating Distressed Exchanges", could mean accelerated defaults for troubled companies pursuing debt buybacks in the open market, and the end of this practice, as companies will have no idea if Moody's will decide they merit the unenviable designation of "Limited Default." In recent months, issuers have increasingly been proposing debt exchanges and tender offers at discounts to par. In many instances, these proposed exchanges reflect an opportunistic motivation as financially healthy issuers see a chance to reduce debt levels at attractive valuations. In other cases, however, the proposals are being made by financially distressed issuers and the effect of the exchange is to allow the issuer to ultimately avoid a default event, whether it is a bankruptcy filing or a missed payment on principal or interest. Exchanges made by distressed issuers at discounts to par which have the effect of allowing the issuer to avoid a bankruptcy filing or a payment default (i.e., "distressed exchanges") are considered default events under Moody’s definition of default. However, since whether an issuer would have defaulted absent an exchange is unobservable, the determination of whether an exchange constitutes a default event is inherently a judgment call. As such, it is important for market participants to understand the criteria Moody’s considers in evaluating whether a particular exchange offer constitutes an event of default. All formal debt exchanges and tender offers are candidates for distressed exchanges. Additionally, open market and bilateral negotiated purchases of debt are also possible candidates for distressed exchanges. While purchases and exchanges are typically voluntary transactions, they can have the effect of allowing the issuer to avoid a bankruptcy filing or missed payment and, therefore, constitute an event of default. In evaluating exchange offers, Moody’s interprets the term "debt exchange" very broadly. For example, when distressed issuers restructure or amend bank loan agreements which have the effect of allowing the issuer to avoid a bankruptcy filing or payment default, such transactions will be classified as distressed exchanges. Moody's Investors Service assigned a Caa1/LD probability of default rating ("PDR") to Hovnanian Enterprises, Inc. ("Hovnanian") following the company's disclosure in its most recent 10-Q filing that between October 31, 2008 and March 11, 2009, it repurchased approximately $368 million face value of senior unsecured and senior subordinated notes at substantial discounts to par. The open market transactions, considered together, constitute a distressed exchange and a limited default by Moody's definition. The LD designation signifies a limited default and also incorporates Moody's expectations of open market transactions at substantial discounts to par over the next twelve months. Two months ago, Zero Hedge wrote about the incentives, most notably from a tax perspective, for corporate issuers to buy back their "distressed" debt after a proposal by Max Baucus was included in the stimulus bill, made it beneficial for companies to repurchase debt in the open market. The irony of Moody's action is that with one ill-crafted sentence it has the potential to undo the stimulus plan's tax benefit to corporate issuers. In summary, CFOs of highly leveraged companies that still have substantial cash amounts on their books, will now have to sweat the trade off of purchasing their cheap debt in the open market, since any tax benefit of doing so (see the linked article) will be eliminated by the threat that Moody's may assume the company merits a Hovnanian-like treatment and downgrade it to Limited Default, this making it impossible for the company to even have hope of accessing the capital markets in the future. Wall Street Back To Its Criminal Ways? There was a time on Wall Street when insider trading was rampant, when sellside analysts would pump stocks under the guidance of their superiors only to have their corporate finance colleagues do an equity offer shortly after, when the amount of money a bank's corporate clients paid would determine its rating, and when analysts said in internal emails a company is worthless, only to issue reports claiming the company was the next sliced bread. Then things changed for the better briefly, when Spitzer came on the stage. However, with his thunderous fall from grace in an act of utter hypocrisy, the behavior he fought so hard to curb started gradually coming back. Yesterday, Wall Street's shadiness came back with a vengeance. 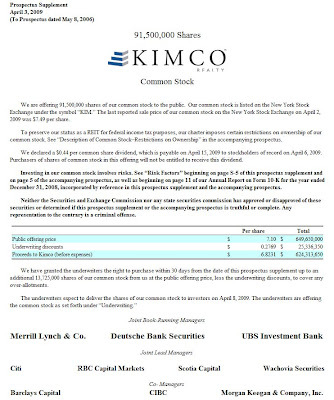 As Zero Hedge disclosed yesterday, mall REIT Kimco decided to dilute its equityholders by issuing over $700 million (including the green shoe) in new shares which would be used to buy back the company's debt, as KIM has $735 million in debt maturities over the next 3 years, and a $707 million currently drawn on its secured credit facility. One look at the company's equity prospectus reveals that the lead underwriter is non other than "scandal-central" investment bank Merrill Lynch. There is, of course, nothing wrong with being a member of an underwriting syndicate - in fact, absent generating profits from AIG structured finance liquidations forever, banks like ML (better known these days as Bank of America's slam dunk acquisition if one listens to Ken Lewis) will need it if they want to generate revenues. However, what Zero Hedge has a major problem with, is what ML equity research analyst Craig Schmidt did hours if not minutes after the offering was announced. 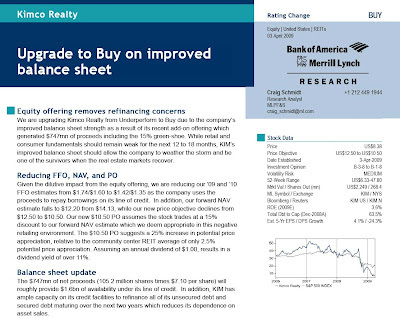 In a research note update, Schmidt, who now gets his paycheck from Bank Of America (this will be relevant in a second), raised KIM's rating from Underperform to Buy. This is where visions of Jack Grubman should resurface. While Zero Hedge will not speculate over the efficiency of the Chinese Wall at Merrill Lynch, aka Bank Of America, something in this transaction stinks to high heaven. 1) First Merrill Lynch/BofA gets clients to subscribe to a massively diluting equity offering (105 million new shares out of 271 million pre-offering shares, or 39% dilution). The offering prices at $7.10/share, a 6% discount to the previous day closing price of $7.49. In the process Merrill pockets an underwriting fee likely equal to 3% of the offering or around $20 million. 2) Minutes after the offering Merrill REIT analyst Schmidt comes out with a report, changing the recommendation on the stock from a Sell to a Buy, thereby getting the vanilla money which makes critical fiduciary decisions merely based on what some sell-side analyst will recommend. As a result Kimco stock rises throughout the day and closes at $9.40, a 25% premium to the closing price, and a 30% premium to offering price of $7.10, which closed that very same day. KIM’s Q4 operating metrics took a back seat to write downs in the quarter as the company reported a sharp drop in FFO as it booked $111.8mn in non-cash impairment charges. These write-downs included $83.1mn for securities investments, $22.2mn for the equity investment in JVs with Prudential and $6.5mn for development projects in addition to $4mn of severance charges due to a reduction in headcount. While Kimco’s shopping center operations held up reasonably well in Q4 (rent spreads remained positive and same-store NOI was +1.4%), the company expects far weaker results in 2009 which is common theme running through the REIT industry. With the extensive write-downs, KIM’s reported 4Q08 FFO of $0.04 was $0.21 below our estimate. Looking to ’09, we expect NOI to decline 3% which includes a 300bp decline in vacancy by YE09. Given the impact of deteriorating operating metrics combined with a sharp reduction in transaction activity, we are reducing our ’09 FFO estimate from $2.15 to $1.74 while our ’10 estimate drops from $2.14 to $1.60. Due to lower projected NOI growth for ‘09, we reduced our forward NAV for KIM from $17.04 to $14.13 and as a result our PO falls from $15.50 to $12.50 which is roughly a 10% discount to forward NAV. Given the weakness in retail spending and cautious leasing environment combined with a sharp erosion in Kimco’s noncore business segments we are maintaining our Underperform rating until we gain better visibility on the retail landscape. 4) Even assuming Merrill's Chinese Wall is fully operational, it would be curious to see how the company managed to "sell" to its clients a stock offering in which its very own analyst had a Sell rating: the cynics among us would presume these very clients would have no problem buying into the offering if they knew or anticipated a change in recommendation (especially one from a Sell to a Buy), and knew they could flip the stock they bought through the offering for a 30% gain in one day! 5) And now for the piece de resistance. The company said in its prospectus it would use the offering proceeds to pay down its revolver. "We intend to use the net proceeds from this offering for debt repayment and for general corporate purposes. Our U.S. revolving credit facility is scheduled to mature in October 2011 and accrues interest at LIBOR plus 0.425% per annum. Affiliates of certain of the underwriters are lenders under our U.S. revolving credit facility and will receive their pro rata share of repayments thereunder from the net proceeds of this offering." That last bit is critical. The company's $1.5 billion credit facility, on which it had $707 million outstanding as of December 31, will be the direct beneficiary of the offering as the entire $707 million amount would be paid down with the proceeds. And what entity benefits from this paydown: none other than Bank Of America, otherwise known as Merrill Lynch! Ah, good old circular conflicts of interest. To summarize: i) Merrill, which is probably not too happy with having lent out Kimco $707 million on its credit facility, underwrites a $720 (including a 15% overallotment) stock offering for which it gets $20 million, ii) Merrill's analyst changes the stock from a Sell to a Buy, causing it to pop 30% in one day, and allegedly allowing participants in the offering to sell their shares at a 30% gain in a day, a mindblowing annualized return, iii) Kimco uses to proceeds to repay Merrill's credit facility, cleaning out any credit risk exposure Merrill might have with respect to Kimco's underperforming properties and operations. At least Schmidt can sleep with a clean conscience after putting the following disclaimer in his report: "I, Craig Schmidt, hereby certify that the views expressed in this research report accurately reflect my personal views about the subject securities and issuers. I also certify that no part of my compensation was, is, or will be, directly or indirectly, related to the specific recommendations or view expressed in this research report." Another point: on March 25, another REIT, AMB properties, on which ML also previously had a Sell rating, raised over $500 million in stock - ML was not a lead arranger on the credit facility, which would end up being repaid with the offering proceeds, but was a lead underwriter on the equity offering. Another ML analyst, Steve Sakwa raised the stock from a Sell to a Neutral (5 day after the event mind you), not a Buy, on the offering. If the deleveraging thesis was indeed the critical issue here, does it not stand to reason that both stocks would have gotten the same rating (either Neutral or Buy) based on the same catalyst? Zero Hedge, for one, hopes that Cuomo is reading Zero Hedge, as this kind of conflicted circularity would never have been allowed in the Spitzer days. 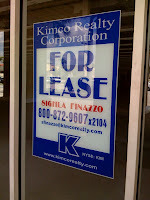 Additionally, on a recent trip, this author stumbled upon a mall in a major metropolitan area where a Michael's store (another LBO special) had recently vacated thousands of square feet of retail space: the beneficiary of this lack of future cash flow: Kimco Realty Corporation. In conclusion - to those that managed to get in on the stock offering: congratulations. The 30% return in one day is nothing to sneeze at. To all those other retail and institutional accounts, who piggybacked, and all day were buying the shares sold by the follow-on participants (likely using Merrill's brokerage desk as an intermediary, thereby generating even more profits for the company), hopefully you see something about the dreary mall REIT space that Zero Hedge is missing. Then again, as these purchasers are likely the very same people who are convinced that all the bad news in this market are lagging indicators, with all the seasonally adjusted "good" news are leading, the fair price of KIM to them is likely much, much higher. We hope they are right: in the meantime it never hurts to look at a cash flow or FFO model, and determine just how much cash a 38% equity-diluted KIM will be generating in the future as the bulk of its mall tenants either go bankrupt or decide they simply can not afford the rising rents that retail REIT operators hope to charge. This past week was very interesting as FX took a cue from the US equities rally and the markets started looking for yield again, further exacerbated as people are starting to question Japan's fundamentals. As we have commented extensively on the weakness of the yen (here and here), we won't rehash but in short, there are not many signs of life coming out of Tokyo. Additionally, the market piled into the investment currencies that ZH has been bullish on; great news right? Unfortunately, with earnings coming up for Q1 the prospects are looking grim for this trend to last. The unwind in FX is not likely to be as dramatic as what we may see in equities but definitely something to keep an eye out for. Additionally, with a RBA interest rate decision and a FOMC minutes release due this week, there's going to be some volatility in the big movers from last week. 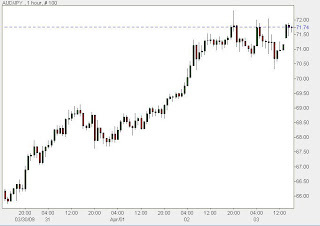 The Aussie rate cut will be interesting to watch as we don't think it's going to be as deep as a 0.5% cut, which is what the market is pricing, in but the market is unlikely to move much even if the number doesn't hit consensus. The market runs unabated... fundamentals have long ceased to matter, and technicals and momentum have taken over... all is based on the printing presses in Geithner's basement stuffing those duffel bags with brand new, sequential dollar bills... investors are searching for fool's gold: credit markets are improving due to the guarantees behind improvements in credit markets, not due to a reduction in risk... the government's intervention is now distorting asset prices across all categories... sovereign CDS widening represents the shift of credit risk from private investors to taxpayers... the pulling of governmental guarantees would be akin to an earthquake just as the house of cards is getting higher and higher... and the political risk tornado will destroy whatever it is the earthquake leaves. In the meantime - question of the evening: who said these words? "The government calmly goes on printing these scraps of paper, because, if it stopped, that would be the end of the government. Because once the printing presses stopped - and that is the prerequisite for the stabilization of the currency - the swindle would at once be brought to light. Believe me, our misery will increase. The scoundrel will get by. The reason: because the State itself has become the biggest swindler and crook. A robbers' state! If the horrified people notice that they can starve on billions, they must arrive at this conclusion: we will no longer submit to a State which is built on the swindling idea of the majority. We want a dictatorship." Is The White House In DE Shaw's Pocket? Larry Summers, who was not only Tim Geithner's predecessor as the 71st Secretary of the Treasury (from 1999 to 2001), but also the 27th President of Harvard University, and is currently the top White House economic advisor and serves as a director of the National Economic Council, apparently has a fond place in his heart and bank account for his most recent employer, $30 billion rocket scientist infested hedge fund D. E. Shaw (nothing like signing an NDA before conducting interviews). In a financial disclosure just released by the White House, Larry highlights that not only was he paid $2 million in 2008 from 40 speaking assignments, including speeches paid for by Goldman Sachs and Yale University, but, more notably, received $5.2 million in compensation from D.E. Shaw - one of the funds eligible and likely to participate in the PPIP and TALF. 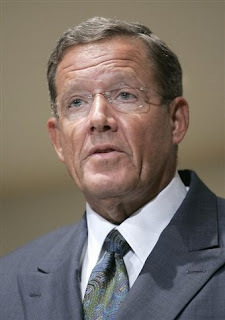 Summers joined DE Shaw on October 19, 2006 as a managing director of the investment and technology department. Larry has recently been in hot water, for not only preaching Friedmanomics (quoted as saying Friedman's real contribution was "convincing people in the importance of allowing free markets to operate") as his administration is currently doing away with Mark To Market and covertly nationalizing the major banks, but also for accepting perks from Citigroup such as free rides on its corporate jet, for telling Chris Dodd to do away with executive pay caps at TARP recipient banks, and for sending Paul Volcker an imaginary memo entitled "stuff it." The full financial disclosure document is attached below. One curious thing to note is that either Larry was drunk or high when he signed it, or else this document is counterfeit, based on the signature for "L.H.S" which is obviously not that of Larry Summers. with his omnipresent signature from his Treasury Secretary days (check out the signature in the bottom right of any 9 year old dollar bill in your back pocket). Regardless of this particular conspiracy theory, ZH will be closely following any and all preferential treatment that DE Shaw (and the entire hedge fund industry in general) receives going forward compliments of Mr. Summers and the Obama administration. "The last shall be first. "Ah, to be a Russia focused hedge fund (for once). Enjoy it while you can. In the meantime, the big boys are doing ok, with no major surprises in either direction. The jobless rate differential between people with less than a high school education (13.3%) and college grads (4.3%) hits a 17 year high. This is pretty bad news for working class people who are really affected by marginal changes in mortgage rates and credit availability. FINalternatives reports that in a startling development, billionaire Tom Hicks, founder of HM Capital (f/k/a Hicks Muse Tate), and subsequently left the private equity firm in 2006, has defaulted on $525 million of loans. According to FINalts "Hicks Sports Group, which owns baseball’s Texas Rangers and hockey’s Dallas Stars, failed to make its interest payment on $525 million in syndicated bank loans on Monday. The group is now in talks with its lenders about a forbearance." Allegedly the loans were secured by the former PE tycoon's extensive sport assets, which include the Texas Rangers (amusingly the Skull and Crossbones alumnus (and fmr president), W, a long-time friend of Hicks will throw the opening pitch Monday), the Dallas Stars, and a 50% stake in soccer club Liverpool. John Williams, who runs the great Shadow Government Statistics site, presents the true numbers behind today's "seriously flawed BLS payroll reporting." The upside bias coming out of the BLS is almost scandalous: one wonders how much "push from above" there is to concoct these numbers. BLS Jobs Reporting Is Seriously Flawed, at Best. This morning’s (April 3rd) reported March jobs loss of 663,000 again was close to consensus expectations, but, as has been common in recent releases, major downward revisions to prior reporting helped to mute the current headline jobs loss significantly. In each of the six most recent monthly payroll reports, the prior month’s payroll level was revised lower. For October 2008 to March 2009 reporting, the downward revisions to the prior month’s seasonally-adjusted payroll level were respectively: 179,000, 199,000, 154,000, 311,000 (still significant net of benchmark revisions), 161,000 and 86,000. Five of the six revisions exceeded the Bureau of Labor Statistics’ (BLS) 95% confidence interval of +/- 129,000 jobs for monthly change. Net of revisions, the March jobs loss would have been 749,000. Net of the Concurrent Seasonal Factor Bias (CSFB), which reflects the reporting problems, the loss would have been 750,000, in line with my estimate in the March 29th Flash Update. Payroll Survey. The BLS reported a statistically-significant, seasonally-adjusted jobs loss of 663,000 (down 749,000 net of revisions) +/- 129,000 (95% confidence interval) for March 2009, following an unrevised 651,000 jobs loss in February, but January’s jobs loss was revised from 655,000 to 741,000. Annual contraction (unadjusted) in total nonfarm payrolls continued to deepen, down 3.56% in March, versus a revised 3.10% (was 3.12%) in February. The annual decline in March was the deepest since July 1958. The seasonally-adjusted series also continued contracting year-to-year, down by 3.48% in March versus a revised 3.08% (was 3.02%) contraction in February. to be counted only if they had been "discouraged" for less than a year. This time qualification defined away the bulk of the discouraged workers. Adding them back into the total unemployed, unemployment in line with common experience, as estimated by the SGS-Alternate Unemployment Measure, rose to about 19.8% in March, from 19.1% in February. ZH is now taking bets what the backward revisions will be for February and March, when April and May numbers are announced (assuming the U.S. hasn't defaulted by then). Dennis Kneale Calls The Treasury "One Big Ponzi Scheme"
Steve Liesman corrects him that the sophisticated term is "monetizing the debt" and we have a race to the bottom as the ponzi goes global. Earlier Barney started war on Mark To Market. Now he is expanding to two fronts, crossing the Volga river deep into republican territory. Just want to pointed out that the whole two-front thing did not work out too well for Germany. For astute readers, the challenge is to spot the 10 occurrences of hypocricy in the Chairman's most recent populist missive. “Today’s employment report underscores the importance of continuing the President’s strategy of promoting recovery by investing in job-creating measures that promote a restoration of shared, sustainable growth. Yesterday the Republicans in Congress unanimously rejected that path by supporting a budget that, if enacted, would choke off the promise of growth in order to pay for more tax cuts for the wealthy. “It is not just Republicans in Washington. In particular, the fact that unemployment continues to grow – an inevitable consequence of the sort of recession we are in – emphasizes the cruelty of those Republican governors who, for political gain, seek to deny unemployed men and women and their children the moderate benefits that the recovery package had for them. Prohibiting people who have lost their jobs from getting the amount of replacement income offered in that bill is about as bad as policy can get from both an economic and social standpoint. According to the Bureau of Labor Statistics, the increase in unemployment in the architecture and engineering occuptions has doubled from 2007 to 2008! This is roughly 4 times the average change in unemployment for all people aged 16 and over, which was 26.1% at the end of 2008. This statistic was relevant when total unemployment was 5.8%. With today's reading of 8.5% unemployment, all bets are off as to what on earth is going on in the U.S. labor market. Nothing like a Friday update from Dave and his recap on why the Kool Aid is flowing freely. Some of the main points presented in the weekly recap. Please read this before you buy even one more stock. We see a very uncertain future, geopolitically, financially, economically. Yes, Oct/02 was a bottom few believed would hold but as we now know, about half of the growth in profits, output and employment was derived from the now defunct super-duper credit cycle. It was a massive leveraged boom. We realize that we have this huge rally on our hands that has definitely gone on longer than we had expected. Perhaps the market was more oversold at the lows and thus had further to “melt up” as the shorts run for cover; looking at how the early cyclicals are flying, there also seems to be a rotation under way based on the emerging view that the recession is about to end (that is a premature assessment, in our view). But we just can’t for the life of us see where the engines of sustainable growth in GDP and profits are going to come from with inventory-to-sales ratios still near cycle-highs in the business sector; the fact that we are still stuck with over 12 months’ supply of unsold new housing inventory with home prices deflating now at an accelerating rate; jobless claims at 27-year highs; the savings rate still in low single-digit terrain. At some point this rally, to be sustained, is going to have to be rooted in something more than just improving from technically oversold levels. And as for the view that the market was way oversold at the March 9th lows having collapsed 57% from the peak, keep in mind that reported earnings plunged an even greater 82%. So the view that this market is somehow attractively priced, that has only been the case all along based on consensus forecast earnings. In fact, what was critical last Friday was the data-point on real personal income less government transfers – it fell 0.8% in February, which was the third decline in a row, and remember that this is why the fiscal stimulus is not enough to call the end of the recession. Organic personal income in real terms has to start to turn higher; in other words, the economy has to show that it has enough vitality to stand on its own two feet without the help of Uncle Sam. If you go back to the second quarter of 2008 when the federal government mailed out a record volume of tax rebates that boosted real disposable income at a whopping 10.7% annual rate, the comparable for what goes into the recession call – real organic income ex-government handouts – contracted at a 2.4% annual rate. The Asia Development Bank just sliced its ex-Japan Asia real GDP forecast to 3.4% for 2009 from the 3.8% estimate in December and the 7.2% forecast last December. The OECD came out with freshly minted forecasts of its own and now sees the output gap for the region widening to 10% by the end of 2010. In other words, deflation, not inflation, looks like the principal risk for the next two years, not just the next year. That would be the largest output gap in four decades. Japan’s GDP is now seen contracting 6.6% this year and by 0.5% next (inflation seen at -1.2% this year and -1.3% next). European GDP is forecast to decline 4.1% in 2009 and by 0.3% in 2010, with inflation at +0.6% and +0.7%, respectively. And in the USA, real GDP is seen contracting 4% this year and FLAT in 2010; inflation seen at -0.4% this year and +0.5% in 2010. That means that NOMINAL GDP declines 4.4% this year and is +0.5% next year, so please tell us that in this environment we don’t end up seeing Treasury yields grind down to 1941 levels or 2003 Japanese levels (i.e. sub-2%). Well, the one thing you cannot just seasonally adjust away is … the pricing! The Case Shiller home price index for the 20 largest US cities fell by 2.8% M/M in January to -19% Y/Y and -26.5% at a 3-month annualized rate. This was slightly worse than consensus and a record decline. Deflation intensified across all markets, bringing the total decline to -29.1% versus the peak in July 2006. Over the month, price declines ranged from -1.2% M/M in Charlotte (-8.2% Y/Y) to - 5.5% M/M in Phoenix (-35% Y/Y). From the peak, prices are now down 29% (and down to a six-year low) … and counting. While some data suggest that demand may be stabilizing or improving, the price never fibs and the continued decline signals that three years into this detonating residential real estate market, there remain more sellers than potential buyers. Full stop. The hardest hit markets continue be those where sub-prime lending was pervasive and foreclosure rates have surged. Such areas include San Francisco, Phoenix, Las Vegas, Miami, and Los Angeles – all off by 40-50% from their respective peaks. The National Association of Realtors reported that 45% of existing sales in January were foreclosure-related – such properties, selling at steep discounts, continue to drive prices lower. Looking ahead, depressed demand, tight credit, rising default rates and excess inventories can be expected to continue to lead prices lower. We estimate that an additional 10%-15% in downside is still in store. How many times can the market rally on the same news? What about the eye popping 1.8% rebound in total factory orders. The durables came out on March 25th and basically foreshadowed the report (and triggered a 1% rally in the S&P 500 that day too – amazing how you can rally twice on the same piece of news … yet everyone seemed to have ignored the sharp downward revisions to the back data … shhhhhh). But what nobody seemed to have noticed was that order backlogs fell 1.4% and are down now for five months running. Could it be, pray tell, that orders are actually being ... cancelled? Shipments dipped 0.1%, which is an improvement from a ‘second-derivative’ standpoint (i.e. less negative) but still down for 7 months in a row. We have data back to 1958 and we’ve never seen a losing streak like that before. In fact, the bounce in February durable goods orders is far less impressive when you consider that it is being calculated off an ever-declining January figure – January orders were first reported as being down 5.2%; then it got revised to down 7.3%; and now it is estimated at -7.8%. The actual level of durable goods orders in February was 4-1/2% lower than what we had thought it was going to be just a few weeks ago. So what has bottomed exactly? Not employment. Not organic real personal income. Not industrial production. Not shipments or order backlogs. Not home prices. Maybe housing starts – but February was the third lowest number on record (583k) so can we really say for sure? The NAHB index (9), but again, it is still at the third lowest level on record. Besides, this is a diffusion index – it ain’t going negative. Home sales? Well, again, at 337k in February they ticked up – but to their second lowest level ever. Is that a definitive bottom? Consumer confidence – yet again, at 26 last month, it was the second lowest on record. The ISM has certainly carved out a low – we do not doubt that. Again, it is a diffusion index, so at 36.3 it is saying that the contraction in industrial activity is not accelerating … but it is ongoing. And please note that the lowest we got in the tech wreck – the month after 9-11, in fact – was 40.8. And the stock market didn’t bottom for another year. So to think a 36.3 print on ISM signals anything but continued recession is pie-in-the-sky, in our view. Embedded in the survey result, as an aside, was the fact that for the second month in a row, not one industry – nada – posted any growth at all in March. And in the special question, we learned that barely over 30% of respondents believed that the fiscal stimulus was going to benefit their company. Despite the financial stocks jumping the shark yesterday, and investors gobbling it all up happily, Richard Ramsden of GS says this is just a load of hot air. Our views on banks do not change following the FASB mark to market rule changes. Our core view is that banks will not bottom until nonperforming asset growth decelerates. All of the data points we track in 1Q point to acceleration. Mark to market accounting changes provide banks with a little bit of Tier 1 capital relief, less earnings volatility from securities impairments (OTTI) as banks now estimate the credit loss rather than take the mark to market charge, and maybe more flexibility in putting assets into Level 3 and marking to model. Against that, however, we note: (1) investors are not focused on Tier 1, (2) for securities, ultimately the losses are what the losses are and if the bank is wrong it will come at a later date, and (3) we believe investors will look through increases in tangible common at the expense of a big increase in Level 3 assets. Also, to the extent that banks do mark up risky securities it will make PPIP even harder to execute as banks will be marked further from the bid. Richard's prediction is that until non-performing assets decelerate there is no bottoming in sight for banks. The math: bank assets are going bad at a 3% annual rate while the rate of pre-provision earning is 2.5% for the industry, that is loans are going bad faster than banks earn money. Looks like the FASB just sold they souls for pennies on the dollar. A letter sent out by the House Committee on Financial Services. Presented without comment. “I applaud the very important actions taken by FASB today, which has made significant progress toward addressing inaccurate asset valuations in the markets. The FASB believes the rule can be applied more fairly and take into account the currently dysfunctional state of some markets. The integrity of the standard-setting process is preserved, while avoiding the pro-cyclical effects of improper valuation practices." If there is one group of companies that has to be ecstatic about the current sucker rally, it has got to be the REITs. First Simon Property Group sold a boatload of stock to naive investors, now Kimco Realty takes center stage with a $623 million follow on offering of 91.5 million shares at $7.1, a 5% discount from yesterday's closing price of $7.49. On March 19, Zero Hedge discussed the upcoming equity dilutions in the REIT space, but it is good to see that stockholders do not care about 25% dilution events like the one by Kimco and just gobble up these stocks. Shareholders will be happy to know they are getting diluted (and will get much more diluted in the future) in order for the company to pay down debt, as it is unable to find comparable terms to roll existing debt into: why not just take the most expensive option? Kimco owns and operates one of North America’s largest portfolios of neighborhood and community shopping centers. As of December 31, 2008, the company owned interests in 1,950 properties comprising 182 million square feet of leasable space across 45 states, Puerto Rico, Canada, Mexico and South America. Some serious cash flow generating assets there. When the man in charge of the second largest borrower in the U.S. is willing to lose his job due to his discomfort with the FASB's shift in accounting rules, you can bet that the tragic fallout of all the "market buoying" recent events is only a matter of time. Somehow this noteworthy event, which happened over a week ago, passed substantially unnoticed until Zero Hedge friend Jonathan Weil at Bloomberg dug it up. Charles Bowsher, who was most recently Chairman of the Federal Home Loan Bank System's Office of Finance and previously served as U.S. comptroller general may be the only truly honorable man in the socialist nexus of politics and finance. The reason for his departure from this critical post - his discomfort in vouching for the banks' combined financial statements. And as Weil puts it succinctly: "Now the question for taxpayers is this: If Charles Bowsher can’t get comfortable with these banks’ financial statements, why should anybody else be?" Why indeed. If Bowsher was merely involved with some marginal organization, this could be perceived as a hypocritical attempt to score populist brownie points. However, the FHLB is among the governmental entities at the heart of the current problem. Zero Hedge has written previously about the FHLB and its critical role in the ongoing housing crisis, but in a nutshell "The Office of Finance issues and services all the debt for the 12 regional Federal Home Loan Banks. That’s a lot of debt -- $1.26 trillion as of Dec. 31, making the FHLBank System the largest U.S. borrower after the federal government. The government-chartered banks, which operate independently, in turn supply low-cost loans to their 8,100 member banks and finance companies. If any of the FHLBanks were to fail, taxpayers could be on the hook." For the fourth quarter of 2008, the FHLBanks said their total preliminary net loss was $672 million. It would have been many times larger, had they included all their red ink. The year-end balance sheet at the FHLBank of Seattle, for example, showed $5.6 billion of non-government mortgage-backed securities that it says it will hold until maturity. Yet the estimated value of those securities was just $3.6 billion. The bank, which reported a $199.4 million net loss for 2008, said the declines were only temporary. They’ve been anything but fleeting, though. Most of those securities have been worth less than they cost for more than a year. The FASB’s rules on this subject, which have never been well defined, are now in flux. Today, after caving in to pressure by the banking industry and members of Congress, the Financial Accounting Standards Board is set to vote on a plan to relax its rules on mark-to-market accounting, so that companies can disregard market prices and ignore losses on their securities indefinitely. Most recently, in 2007, he led an independent committee that issued a blistering report on financial missteps at the Smithsonian Institution, whose board of regents included U.S. Chief Justice John Roberts. And how does the FHLB spin this event? "Mr. Bowsher has expressed his concerns to me around the complexity of valuing mortgage-backed securities and the process of producing combined financial statements from the 12 home loan banks. I don’t think it’s appropriate for us to speak for Mr. Bowsher." So: to paraphrase - one of the men who knows the ins and outs of the financials of banks involved in the mortgage crisis more intimately than even Bernanke and Geithner, let alone Obama, is saying that the newly implemented changes by the FASB will throw the whole system into tailspin and he want none of it. Oh and yes, let's hold a moment of silence for Lehman which held billions of mortgage backed securities that it too was "holding until maturity." Well, Lehman is no more, and all these securities now trade, in the form of the company's general unsecured claims, at the generous price of 12 cents on the dollar... Furthermore, one can't say the market is illiquid - the bid-ask spread is only 1 cent. And as there are over $150 billion of these claims floating around, one can't say the market is in any way limited from a price discovery standpoint. The ridiculous market moves in March have dealt Dan Loeb a tough hand, causing Third Point to lose 3.1%, bringing its YTD performance to -1.5%. The 8.8% run up in the S&P will spare few hedge funds and as the performance letters start rolling in, I expect to see much more pain for managers who did not flip shorts fast enough, or got caught in the Citi arb. In the meantime, seven card stud David Einhorn and his Greenlight are rocking it with a 4.5% return in march and a 5.5% return for Q1. Among his profitable positions reader anonymous speculates were his VMware short and EMC long, and of course his big time bet in GLD and GDX. On the losing side are likely Arkema and Criteria Caixa. 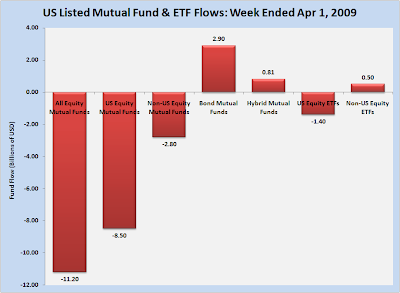 TrimTabs is out with the latest mutual fund flows for the week ended April 1. The research company estimates that the past week saw $11.2 billion in outflows among the equity mutual fund community, which doesn't jive too well with all the rampant speculation about vanilla money running head over heels to throw their money into the rally. TrimTabs estimates the prior week inflow to $1.7 billion, implying a new swing of over $12.5 billion WoW. Equity funds that invest primarily in U.S. stocks posted an outflow of $8.5 billion, versus a revised inflow of $2.3 billion in the previous week. Equity funds that invest primarily in non-U.S. stocks had an outflow of $2.8 billion, versus a revised outflow of $557 million in the previous week. In addition, bond funds had an inflow of $2.9 billion, versus a revised inflow of $7.1 billion in the previous week, and hybrid funds had an inflow of $810 million, versus a revised inflow of $451 million in the previous week. Separately, TrimTabs reports that exchange-traded funds (ETFs) that invest in U.S. stocks posted an outflow of $1.4 billion, versus an outflow of $5.0 billion in the previous week. ETFs that invest in non-U.S. stocks had an inflow of $502 million, versus an inflow of $1.6 billion in the previous week. 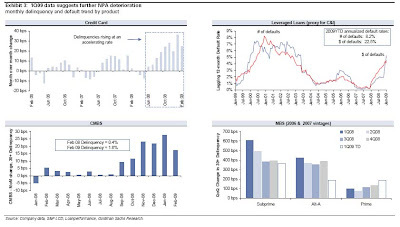 Daily Credit Market Summary: April 2: Now What? Spreads were tighter in the US today as all the indices improved, although IG and HVOL ended at the day’s wides. Indices typically underperformed single-names with skews mostly narrower as IG underperformed but narrowed the skew, HVOL underperformed but narrowed the skew, ExHVOL intrinsics beat and narrowed the skew, XO underperformed but compressed the skew, and HY outperformed but narrowed the skew. The names having the largest impact on IG are International Lease Finance Corp. (-96.8bps) pushing IG 0.53bps tighter, and American International Group, Inc. (+112.89bps) adding 0.52bps to IG. HVOL is more sensitive with International Lease Finance Corp. pushing it 2.53bps tighter, and American International Group, Inc. contributing 2.47bps to HVOL's change today. The less volatile ExHVOL's move today is driven by both Staples Inc. (-26.5bps) pushing the index 0.27bps tighter, and Comcast Corp. (+3bps) adding 0.03bps to ExHVOL. The price of investment grade credit rose 0.16% to around 95.76% of par, while the price of high yield credits rose 1.18% to around 70.31% of par. ABX market prices are higher (improving) by 0.43% of par or in absolute terms, 1.69%. Broadly speaking, CMBX market prices are higher (improving) by 0.13% of par or in absolute terms, 0.38%. Volatility (VIX) is down 0.24pts to 42.21%, with 10Y TSY selling off (yield rising) 10.1bps to 2.76% and the 2s10s curve steepened by 3bps, as the cost of protection on US Treasuries rose 3bps to 65bps. 2Y swap spreads tightened 0.3bps to 57bps, as the TED Spread tightened by 2.5bps to 0.95% and Libor-OIS improved 0.6bps to 94.8bps. The Dollar weakened with DXY falling 1.24% to 84.446, Oil rising $4.03 to $52.42 (outperforming the dollar as the value of Oil (rebased to the value of gold) rose by 9.35% today (a 7.09% rise in the relative (dollar adjusted) value of a barrel of oil), and Gold dropping $8.7 to $918.7 as the S&P rallies (836.6 3.39%) outperforming IG credits (198bps 0.17%) while IG, which opened tighter at 196bps, underperforms HY credits. IG11 and XOver11 are -5.5bps and -37bps respectively while ITRX11 is -10.5bps to 168bps. 68% of IG credits are shifting by more than 3bps and 70% of the CDX universe are also shifting significantly (more than the 5 day average of 63%). The number of names wider than the index decreased by 1 to 48 as the day's range fell to 8bps (one-week average 8.6bps), between low bid at 192 and high offer at 200 and higher beta credits (-3.02%) underperformed lower beta credits (-3.54%). In IG, wideners were outpaced by tighteners by around 8-to-1, with only 7 credits wider. By sector, CONS saw 0% names wider, ENRGs 0% names wider, FINLs 10% names wider, INDUs 7% names wider, and TMTs 13% names wider. Focusing on non-financials, Europe (ITRX Main exFINLS) outperformed US (IG12 exFINLs) with the former trading at 167.75bps and the latter at 186.18bps. Cross Market, we are seeing the HY-XOver spread compressing to 682.39bps from 708.24bps, but remains below the short-term average of 711.63bps, with the HY/XOver ratio rising to 1.74x, below its 5-day mean of 1.76x. The IG-Main spread decompressed to 30bps from 23.25bps, but remains above the short-term average of 22.44bps, with the IG/Main ratio rising to 1.18x, above its 5-day mean of 1.13x. In the US, non-financials outperformed financials as IG11 ExFINLs are tighter by 6.8bps to 186.2bps, with 91 of the 104 names tighter. while among US Financials, the CDR Counterparty Risk Index fell 15.02bps to 257.3bps, with Finance names (worst) tighter by 44.13bps to 1126.43bps, Banks (best) tighter by 22.04bps to 344.79bps, and Brokers tighter by 20.63bps to 323.95bps. Monolines are trading tighter on average by 159.82bps (4.85%) to 2655.17bps. (Note that most financials are still wider on the week). In IG12, FINLs underperformed non-FINLs (2.52% tighter to 3.51% tighter respectively), with the former (IG11 FINLs) tighter by 14bps to 542.5bps, with 18 of the 21 names tighter. The IG CDS market (as per CDX) is 12.9bps rich (we'd expect LQD to outperform TLH) to the LQD-TLH-implied valuation of investment grade credit (210.95bps), with the bond ETFs outperforming the IG CDS market by around 3.16bps. In Europe, ITRX Main ex-FINLs (underperforming FINLs) rallied 9.25bps to 167.75bps (with ITRX FINLs -trending wider- better by 15.5 to 169bps) and is currently trading in the middle of the week's range at 41.27%, between 177 to 161.25bps, and is trending wider. Main LoVOL (sideways trading) is currently trading tight to its week's range at 5.96%, between 113.29 to 102.46bps. ExHVOL underperformed LoVOL as the differential decompressed to 10.26bps from 2.8bps, but remains above the short-term average of 0.81bps. The Main exFINLS to IG ExHVOL differential compressed to 54.38bps from 60.91bps, but remains below the short-term average of 61.75bps. CDR LQD 50 NAIG091 -12.76bps to 282.92 (3 wider - 46 tighter <> 35 steeper - 15 flatter). CDX12 IG -3.75bps to 198 ($0.16 to $95.76) (FV -7.89bps to 240.52) (7 wider - 110 tighter <> 72 steeper - 53 flatter) - Trend Wider. CDX12 HVOL -7bps to 466 (FV -18.92bps to 646.45) (4 wider - 24 tighter <> 18 steeper - 12 flatter) - Trend Wider. CDX12 ExHVOL -2.72bps to 113.37 (FV -4.96bps to 132.23) (3 wider - 92 tighter <> 41 steeper - 54 flatter). CDX11 XO -13.5bps to 551.8 (FV -24.85bps to 579.58) (2 wider - 29 tighter <> 25 steeper - 9 flatter) - Trend Wider. CDX11 HY (30% recovery) Px $+1.18 to $70.31 / -62.8bps to 1604.9 (FV -51.9bps to 1292) (15 wider - 79 tighter <> 69 steeper - 29 flatter) - Trend Tighter. LCDX10 (55% recovery) Px $+1.1 to $74.1 / -91.27bps to 1516.2 - Trend Wider. MCDX11 -4.5bps to 225bps. - No Trend. CDR Counterparty Risk Index fell 15.02bps (-5.51%) to 257.3bps (0 wider - 15 tighter). 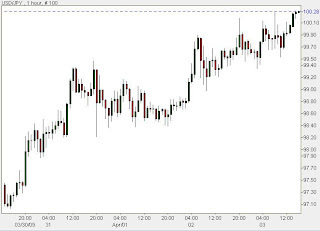 DXY weakened 1.24% to 84.45. Oil rose $4.13 to $52.52. Gold fell $8.7 to $918.7. VIX fell 0.24pts to 42.21%. 10Y US Treasury yields rose 10.5bps to 2.76%. 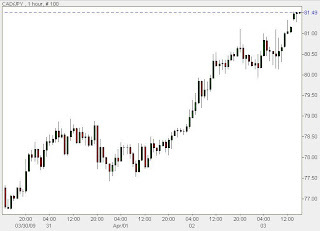 S&P500 Futures gained 3.37% to 836.5. Bill Gross, fresh from swimming in the nickel and dime pool, and purchasing another zillion in MBS, shares some insight. Amusingly, PIMCO is now on Facebook and Twitter, with a new friendlier, jollier, less taxpayer-crippling and hyperinflation inducing face. It is interesting to note that the last time the "bear market ended" on November 11, the market retraced 27.37% to its period high on January 6 before crashing and burning. The current retracement from March 6 is now at 26.82%. ZH does not believe in technicals exclusively, but this is a curious perspective. Additionally, whereas CNBC would chirp every 5 minutes when the Baltic Dry was up, up and away beginning in January, very little attention has been brought to the fact that the BDIY has dropped over 31% over the past month... but nobody cares about the "China factor" anymore, as the US can brave the depression, er, recession (sorry, Cramer corrected me) on its own. Another datapoint: the 2s10s curve has retraced 75% of the post-QE move. Inflationary worries are overwhelming even the most vociferous government buybacks. And lastly, IG12 just broke intraday wides at 197/199 to close - a mere 3 inside yesterday's close. Aside from these points, everything is rosy. 10. Would it be preferable for the selling bank to take a note from the PPIF in exchange for the pool of loans and other assets that it sells? Alternatively, what would be the advantages and disadvantages of structuring the program so that the PPIF issues debt publicly in order to pay cash to the selling bank? Would a public issuance of debt by the PPIF limit its flexibility compared to the issuance of a note to a selling bank? 2. Which asset categories should be eligible for sale through the LLP? Should the program initially focus only on legacy real estate assets or should any asset on bank balance sheets be eligible for sale? Are there specific portfolios where there would be more or less interest in selling through the LLP? Assuming there is sufficient endorsing response on point 10, the PPIP, as currently structured may end up getting turned around on its head. Instead of providing outright guarantees to the non recourse loans that will be used to purchase legacy loans (thus benefitting "private" investors such as PIMCO), the FDIC may end up issuing FDIC-backed notes directly to the banks that are selling loans. The presumption is that by exchanging illiquid loans into FDIC guarantee debt, the selling banks would "strengthen their balance sheets." The FDIC notes would carry higher ratings and may also be eligible for use as collateral for Federal Reserve loan facilities (thus allowing these toxic assets to be used as leverage). In exchange for this principal risk, the banks would get an equity upside component themselves. According to Jim Wigand, FDIC deputy director for resolutions and receiverships, "One option is for the seller to retain an equity interest as a part of the consideration for the sale." A logical push back to this proposal was voiced by Jones Day partner Chip MacDonald: “[Banks] may need the liquidity of those notes, and it’s not clear there will be a meaningful secondary market for them so banks could sell them for cash." 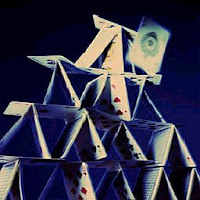 Furthermore, the potential abuses arising from conflicts of interest, as the banks would take positions on both sides of the transaction, could be dramatic, although likely to have little impact in the FDIC's ultimate decision which has long since lost any credibility of a fair and equitable arbiter. Additionally, point 2 opens up the potential for banks to endorse the FDIC's support of virtually any security to be eligible for taxpayer subsidies: if this is not nationalization in anything but name, we would refer to our readers to point out how better to call it. Of course, the parties most opposed to this would be the PIMROCKs of the world, who will thus be unable to participate via a cheap 12x leveraged equity position in the legacy loans. "assets" to Level 3 equivalency status, and thus the RFC may just be a way out for the FDIC to jettison the whole legacy loan program after receiving "too many divergent opinions." Additionally points 14 and 17 (see below) are just amusing in their entirety, so I present them without comment. The entire RFC is presented in its entirety below, and there is an April 10th deadline for comments. We encourage our non-braindead (yet) readers to submit what they really think about the legacy loan program directly to the FDIC. 1. Which asset categories should be eligible for sale through the LLP? Should the program initially focus only on legacy real estate assets or should any asset on bank balance sheets be eligible for sale? Are there specific portfolios where there would be more or less interest in selling through the LLP? 2. Should the initial investors be permitted to pledge, sell or transfer their interests in the PPIF? If so, how should the FDIC ensure that subsequent investors meet the program's criteria for investors? 3. What is the appropriate percentage of government equity participation which will maximize returns for taxpayers while assuring integrity in the pricing by private investors? How would a higher investment percentage on the part of the government impact private investment in PPIFs? Should the amount of the government's investment depend on the type of portfolio? 4. Is there any reason that investors' identities should not be made publicly available? 5. How can the FDIC best encourage a broad and diverse range of investment participation? How can the FDIC best structure the valuation and bidding process to motivate sellers to bring assets to the PPIF? 6. What type of auction process facilitates the broadest investor participation? Should we require investors to bid on the entire equity stake of a PPIF, or should we allow investors to bid on partial stakes in a PPIF? If the latter, would a Dutch auction process or some other structure provide the best mechanism for bridging the potential gap between what investors might bid and recoverable value? If multiple investors are allowed to bid through a Dutch auction, or similar process, how should asset management control be determined? 7. What priorities (i.e., types of assets) should the FDIC consider in deciding which pools to set for the initial PPIF auctions? 8. What are the optimal size and characteristics of a pool for a PPIF? 9. What parameters of the note and its rate structure would be essential for a potential private capital investor to know at the time of the equity auction to provide equity? 11. In return for its guarantee of the debt of the PPIF, the FDIC will be paid an annual fee based on the amount of debt outstanding. Should the guarantee fee be adjusted based on the risk characteristics of the underlying pool or other criteria? 12. Should the program include provisions under which the government would increase its participation in any investment returns that exceed a specified trigger level? If so, what would be the appropriate level and how should that participation be structured? 13. Should the program permit multiple selling banks to pool assets for sale? If so, what constraints should be applied to such pooling arrangements? How can the PPIF structure equitably accommodate participation by smaller institutions? Under what process would proceeds be allocated to selling banks if they pool assets? 14. What are the potential conflicts which could arise among LLP participants? What structural arrangements and safeguards should the FDIC put into place to address or mitigate those concerns? 15. What should the relative role of the government and private sector be in the selection and oversight of asset managers? How can the FDIC most effectively oversee asset management to protect the government's investment, while providing flexibility for working assets in a way which promotes profitability for both public and private investors? 16. How should on-going servicing requirements of underlying assets be sold to a PPIF and paid for? Should value be separately attributed to control of the servicing rights? 17. Should data used by the independent valuation consultant, as well as results of such consultant's analysis, be made available to potential bidders? Should it be made available to potential sellers prior to their decision to submit assets to bid? Comments on the LLP may be submitted until April 10, 2009. E-mail: LLPComments@FDIC.gov. Include "Legacy Loans Program" in the subject line of the message. Mail: Robert E. Feldman, Executive Secretary, Attention: Comments, Federal Deposit Insurance Corporation, 550 17th Street, NW., Washington, DC 20429. As Zero Hedge postulated a month ago, the VIX - sovereign CDS inverse correlation is becoming more and more evident. Today's action is representative: as VIX continues to slowly trickle lower, US protection is 5 wider. 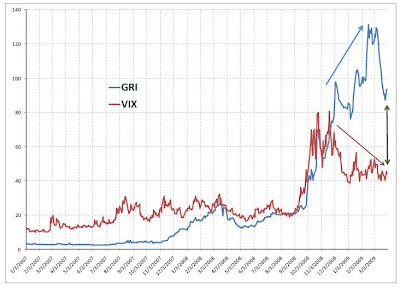 With the G20 pledging trillions to battle every cough and sneeze of the markets, the question becomes what does all this mean for sovereign default risk, and thus VIX, and thus equity markets. With G7 or G20 or Gx debt soon to hit astronomical (this is a technical term) levels, how will all the interest cash flow be funded? How will skyrocketing sovereign deficits be funded? Who will keep on buying UK and German (not to mention US) debt after several failed auctions over the past 3 months? Many questions with no answers - in the meantime, we either just crossed from deflation into inflation today (which is the most laughable thesis if one actually looks at macro data and the level of consumer wealth: for reference just dial David Rosenberg), or the market is just rallying on the biggest sucker rally in recent years with vanilla, smart, retail and all other sorts of money just hoping for the greatest greater fool effect in generations. Cramer just pronounced the "market depression" that started post Lehman as over. Now we are merely in a recession. Zero Hedge is happy to introduce its newest contributor, Travis, whose extensive background in the intricacies of the ultraluxury world will provide a welcome perspective on the mysterious world of goods that usually show up in the pages of the Robb Report, on the walls of Stevie Cohen's uber-plumbed mansions and on the wrists of momentum chasing day traders (one has to give it to them: they have made a mint over the past month; their mutual fund brethren who are only now getting involved will be stuck wearing a '98 Ironman). We hope, as the government expands the PPIP and TALF to include such asset classes as BBB tranches on Patek Philippe and Monet-securitized asset pools, to present the information needed to make informed decisions on whether 6x leverage is sufficient to purchase that Murcielago whole loan trading at 22 cents on the dollar which as Kudlow says, is absolutely money good. The Rolex is Real; But Are the Stories True? Amid BASELWORLD 2009 drawing to a close, “The World Watch and Jewellery Show” (their funny spelling, not ours), rumors abound for perhaps its biggest showcase, the self-crowned “800-lb. Gorilla” Rolex. It seems not only did the fallen financier Bernard Madoff have a penchant for ripping-off golf buddies, club cohorts- the rich, the famous, the charitable and anonymous alike; he also cheated their wrists. Rumors began to swirl, or in Rolex’s solid case of 904L Stainless Steel, Perpetual-ate, when the past CEO Patrick Heiniger abruptly stepped-down due to “personal interests,” only to be replaced by former banker and CFO Bruno Meier in December 2008. Meier is just the fourth CEO in Rolex’s 104-year history. The Heinigers both Patrick and father Andre, having taken-over Rolex’s affairs since the passing of its founder, Hans Wilsdorf in 1960. Was Heiniger responsible for losing the better of a Billion to Madoff? Wouldn’t be the first charity to be shaken down by the Ponzimeister. Rolex, notoriously quiet and secretive among the hallowed Swiss wristwatch industry (in itself infamously shrouded in a bit of legend and mystique) is controlled by the Hans Wilsdorf Foundation, a charitable trust that supposedly donates a lion’s share of Rolex profits to hundreds, thousands, millions (pick a number, any number) of charities and causes worldwide. Again, any and all figures, facts and stories confirmed or denied by the company are estimates, with much if not all truth coming from dealers and industry insiders; most of whom are bitter and disgruntled, not only at Rolex, but at the downturn of the luxury goods market whose business has plummeted with the recession by about 40%. Though most loosely associated with Rolex are smitten and arrogantly aware of the only wristwatch that really matters, both in value and brand-recognition; the truth is- their dealer networks have been cut short by the company, pulling and controlling franchises of rights, forcing products, controlling prices and dumping inventories on retailers struggling to stay open in the malls across the world, no to mention boutiques on 5th Avenue, Worth Avenue, Rodeo Drive, Bond Street, maybe even shady 47th Street too. Revenge of the investment bankers! 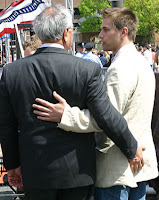 David Faber All Over The "Blogosphere"
47% More Pain For NY Real Estate?